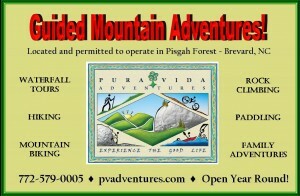 The mission of Pura Vida Adventures is to offer safe personal trips to families and small groups which focus on exploration,discovery, and adventure. We offer guided climbing, canyoneering, mountain biking, hiking, backpacking,waterfall tours, adventure race instruction and paddling trips. We also provide you with an opportunity to see the North Carolina mountains through any variety of these activities over one day or a series of days.